The story begins just two days after the earthquake with amazing pictures and accounts of the immediate responders to Port-au-Prince. Heroic stories and accounts of life saving operations are woven with vivid, moving photographs taken by numerous professional photographers including Antonio Bolfo, Ron Haviv, Paul Sebring and Cosmin Cosma. 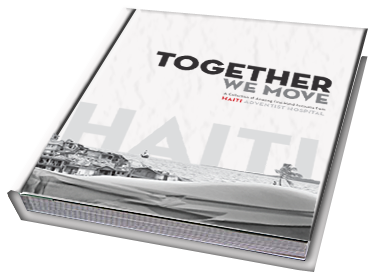 With each turn of the page you will travel and experience the events that transformed Haiti Adventist Hospital from a rescue orthopedic center to what is now one of the main referral centers in all of Haiti and a leader in providing orthopedic care for the indigent. Chronic, life altering orthopedic conditions are now treated on a daily basis and these stories are shared through the first person accounts of over 30 volunteer doctors, nurses and volunteers who traveled to Port au Prince to serve those in need. 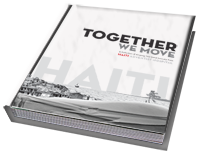 Haiti: Together We Move is 108 pages of incredible stories and photographs that will open your eyes and hearts to those in need in Haiti. We invite you to purchase a copy for yourself and help support the thousands in need all across Haiti. Minimum donation for a copy of the book is $50.00. Please specify your quantity below. Our system will automatically adjust your minimum donation. Please use this page if you wish to receive a single or multiple books at the suggested donation above. Should you wish to receive a copy of the book while donating a larger amount to the Haiti Indigent Patient Fund please use our general donations page by clicking here. All proceeds from donations go to the fund and will pay for the medical care of the Indigent. Your donation is subject to our terms and conditions.